Back when I was still making foolish promises, I said I was going to bake all the previous BBBabe breads. Recently, we were given a bottle of walnut oil. And I started thinking again about the BBBabes’ walnut bread based on a recipe in my favourite book, “The Italian Baker” by Carol Field. We were headed to Kensington market and Chinatown to get a few things and I suddenly announced that I needed walnuts. And brown rice flour. me: I want to make the BBBabes’ walnut bread. he: What will we have it with? me: Tanna served it with some kind of stew. She said it was fabulous. he: What kind of stew? [grimacing] Vegetarian? me: No. No. Meat!! Tanna is from Texas…. The bread looks really good. Do you want to see a picture? he: No. I trust you. Let’s go!! And off we rode on our bikes into the beautiful sunny crisp day. Saturday 29 October, 18:53: About 2 hours ago (I love taking way too long to do things), armed with newly purchased brown rice flour and walnuts (we bought walnut pieces rather than whole walnuts), I got cracking. I stuck the walnuts into the toaster oven for 6 minutes. Nothing. I set the timer for another 2 minutes. Still nothing. The walnuts were raw and completely non-aromatic. Another 2 minutes. Aha!! There we go. And I poured them into a bowl to cool. Then I started weighing the flours. And got to the part about finely ground rolled oats. Oh oh. I was SURE we had lots of rolled oats left. I was short by about 80 gms. So I grabbed the box of oat groats. Then I grabbed the electric coffee grinder, cleaned it out with rice and ground the rolled oats and oat groats into a fine powder. Beautiful!!! Of course I had Tanna’s instructions in front of me. But I opened Carol Field’s book to her Walnut Bread and took a look there. Ooooh. Interesting. Field calls for quite a lot of honey and olive oil in the dough. So I added some honey. But not lots. And then decided against adding the oil. The dough was beautifully soft. Hmmm. Actually, it was loose. Almost croc-like. (What IS it about those BBBabes and their fascination with sloppy dough?! ;-)) But it wasn’t impossible to deal with. I forged ahead. And just as I was about to knead in the walnut pieces, in walked T.
he: Whoa!! That’s a lot of dough! How many loaves does this make? I hope we like it. me: Yes. I’m sure we’ll love it. he: I think that’s too many walnuts. he: No, no. You’re right. [hurrying away] Never mind…. I finished kneading the bread and then in a very uncharacteristic way, I decided to follow the instructions and oil the rising bowl. I wanted to use the walnut oil…. I covered the bowl and onto the counter it went. I think I’ll put it in the fridge overnight to prevent a repeat of the attack of the yeasties. 20:03: I turned the dough before putting it into the fridge. It was very soft and lovely. Remarkably soft and lovely. Knead in the remaining flour to get a firm, elastic and no longer sticky dough. Firm and elastic, eh? Now I am wondering if I remembered to add the whole wheat flour… I don’t remember specifically adding that flour… Rrrrrrr Perhaps I’ll learn to read AND retain. And hey. Here’s an idea. Perhaps I’ll also learn to get all the ingredients out and put them away as I use them to prevent this sort of thing from happening. Hmmm. Maybe I should try adding some extra whole wheat flour when I shape the bread…. Sunday, 30 October, 09:40: The dough had almost doubled in the fridge. It’s sitting on the counter now just to come up to room temperature… hahhahahahahahahaha …as if that’s going to happen when the kitchen is about 15C!! Still, 15C is higher than fridge temperature. In the meantime, I thought I’d leaf through Carol Field’s book again. Oh oh!!! (There’s that reading problem again!) Now I see that the recipe Tanna used isn’t a huge variation on Pane di Noci on page 200,201 in the ‘Celebration Breads’ chapter but an almost identical representation of the recipe for Pane ai Cinque Cereali con Noci on pages 176-178 in the ‘New Breads’ chapter; ie: no honey, no oil…. Heh. And yet I feel certain that the honey won’t go amiss. I also see that I was supposed to chop the walnuts into smaller pieces. Toast the walnuts at 350 to 400° F for 6 to 7 minutes. […] When cool, chop and set aside. Chop the walnuts to coarse crumbs with a sharp knife or in a food processor fitted with the steel blade. Ha. So much for my reading skills, no matter which walnut bread recipe I looked at. I certainly didn’t grind the walnut pieces finely. I didn’t grind them at all. Last night, T and I had a discussion about whether the walnut pieces we had bought were small enough already. We both agreed that we didn’t want them so small that we wouldn’t know that they were there until tasting the bread and left them be. 18:40: I just pulled the most beautiful loaves out of the oven. And do they ever smell fantastic!! They’re much lighter than I expected too. Yay!! Just to backtrack a little… I finally shaped the bread around noon. I was absolutely amazed that the dough did NOT come cleanly out of the bowl. Even though I oiled the bowl. I haven’t oiled the rising bowl in years. I haven’t had a problem with dough sticking to the sides of the bowl in the same number of years. Is that weird, or what?! When it came to it, I also decided against adding extra flour. I had run the tape in my head back over and over and am absolutely certain I added all the flours. I did liberally flour the board though. The dough was a little sticky but not overly so. The shaped bread didn’t pop in the oven quite as much as I expected. By the same token, it didn’t deflate as much as I expected when I slashed it just before putting it in the oven. After dinner, we each tasted a slice. We lightly toasted them just to warm them up. I tasted a corner. Fabulous!!! And then we slathered them with butter. Moan!! This. Is. The. Best. Bread!!!! mixing In the evening of the day before you will be baking the bread, toast the walnut pieces at 350-400F for about 6 minutes until they smell fragrant and are just tinged with gold. Be very careful not to allow them to burn. Set aside to cool. Put the yeast, honey and lukewarm water into a large mixing bowl and whisk well. Set aside for a few moments. In another bowl, mix together all the flours. Add the room temperature water to the yeasted water. Dump in about two thirds of the flour mixture and stir together. This will be quite wet. Stir in the salt with the rest of the flour mixture. kneading Turn the dough out onto a lightly floured board. It might be a bit sloppy if you have forgotten to add the whole wheat flour. Wash and dry the bowl. This prepares the rising bowl AND gets your hands clean. Without adding any extra flour, knead the dough until silky (5 to 10 minutes). Let your dough scraper (a spatula works) be your friend when the dough is sticking to the board. Keep scraping up any dough that is on the board and adding it back into the actual dough so the board is always clear. Rub the sides of the clean mixing bowl with walnut oil. Slop the kneaded dough in and cover with a plate and allow to rise in a no-draught area (warm room temperature) for an hour or so. With the back of your hand against the inside of the bowl, slip your fingers down the side of the bowl to the bottom and gently scoop the bottom of the dough up and around to the top. Turn the bowl a quarter turn and repeat. Do this 4 or 5 times, cover the bowl again with a plate and put it in the fridge overnight. The next morning, bring it out to bring up to room temperature and ensure that the dough has doubled. shaping: Put the dough onto a lightly floured board. Cut it in two three pieces and shape each into a round. Gently fold one of the pieces like a business letter. Then gently grabbing the side of one of the ends, make a false braid. Fold the top half over to the middle and gently make another false braid. The dough will want to roll in on itself. This is a good thing. Once it shapes itself into a quasi ball, put it seam-side down on the board and gently turn it round and round to smooth out any rough edges. Repeat until there are 3 rounds. Cover all with clean tea towels and a couple of plastic grocery bags draped overtop. Leave on the counter (again, out of drafts) to rise until not quite double. Tanna wrote A little cream cheese on the bread and hot chili and we had a delightful dinner. Carol Field suggests Serve with smoked meats, smoked salmon, oysters and mussels, and sharp cheeses. I was thinking about butternut squash soup and serving a couple of different sharp cheeses on the side. What could be better for a fall night? 1.) Yeast and Water: Field calls for more than 3 tsp of active dry yeast. That just seemed excessive to me so I reduced it to 2½ tsp (8gm). I would have gone even lower if I hadn’t been adding honey. Note that tap water is fine to use – just make sure that it has stood for at least 12 hours so that the chlorine has dissipated. Under no circumstances should you use water from the hot water tap. Of course, saying that it is unsafe to use water from the hot water tap might be an urban myth, but why tempt fate? Heat the water in a kettle or microwave and add cold water until it is the correct temperature, (use the baby bottle test on the back of your wrist – your fingers have no idea of temperature!) Or you can use a thermometer. The temperature should be BELOW 120F because yeast begins to die when the temperature is higher than 120F. 2.) Oat flour Because we didn’t have enough rolled oats, I used oat groats as well. I probably could have substituted quick oats but decided that this was supposed to be a whole grain loaf. 3.) Walnut Oil Even though it is entirely unnecessary to oil the rising bowl (when the dough has risen enough, it just slips out of an un-oiled bowl leaving only the tiniest trace on the sides that dough has been touching it at all), I decided that because we had walnut oil, it would be fun to use. 4.) Oven Temperature and Rack Placement: Because there is honey in the dough, I put the stone on a higher rack. Also, the oven temperature for the second half of baking is a little lower than for most bread: 350F. If the bottom of the bread is getting done before top (and center), turn the oven down further. We toasted slices for breakfast yesterday morning and had them with butter, goat’s cheese and/or honey. It was a delicious combination. Although, surprisingly, the goat’s cheese almost over-powered the bread’s delicate flavour! I have only one complaint about this bread. Why didn’t the BBBabes badger me to make this bread sooner? Hmmmm????? It just happens to have 4 or 5 other healthy grains in it. When you taste this bread, you’ll see that it’s no wonder the BBBabes loved this bread! The section on rustic breads is worth the price of the book. In the first few months after receiving it for Christmas 2000 (my first ‘serious’ bread book, I worked my way through almost all the bread recipes in the rustic bread section of the book. There were only two that we weren’t wild about (Pane Siciliano and the dreaded croc). And it’s Field’s book I open whenever we have pizza or foccaccia. It really is one of the best bread books to have on hand. For each recipe, there are instructions for preparing by hand, by food processor and by mixer. Field travelled all over Italy, visiting bakers to learn recipes and then translated them into North American flour types. As you can see from the photo, I have used my copy of the book so many times that the spine has broken. I’d replace it except then I’d have to transfer all my notes. One of the best lessons I learned from reading “The Italian Baker” is to add a small amount of whole wheat flour to white flour in order to mimic hand-milled flour. For loaves that are look to be made with only white flour, this adds just the right trace of nuttiness and a depth of flavour that is missing with just white flour. I’ve had more than my share of several-grain breads and have never been particularly knocked out by their taste. But when I bit into this and let the crunch and rich flavor of the toasted [walnuts] race across my tongue, I knew I had left the world of health food for something a good deal more intriguing. […] [I]t’s those lovely nuts that make a particularly tasty bread. Serve with smoked meats, smoked salmon, oysters and mussels, and sharp cheeses. This entry was posted in anniversaries, baking, BBBabes, bread - yeasted & unyeasted, bread recipe, cookbooks, etc., food & drink, posts with recipes on Tuesday, 1 November 2011 by ejm. Um, you know I’ve been meaning to bake that other walnut bread! Really glad you enjoyed this one. 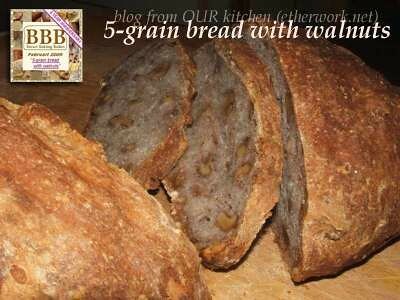 I always like walnut bread, I don’t make it as often as other bread, but yours make me so tempting.